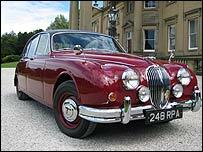 The burgundy Mark II Jaguar used on TV's Inspector Morse series has been sold for more than £100,000. The 1960 car, made famous by the late John Thaw as the crossword, opera and real ale-loving Oxford detective, was snapped up by a UK-based businessman. The Jaguar was sold in a sealed bid tender by the liquidators of a firm that had previously owned it. Asset managers Walker Singleton said the car "fully realised" its estimate but did not disclose the exact price. Howard Eastwood, who handled the sale, described the interest in the car as "extraordinary, reflective of the high affection and recognition the car has, not just in the UK, but around the world". The 2.4 litre car, which has a top speed of 120mph and 79,460 miles on the clock, has been described as "the most recognisable Mark II Jaguar in the world". In July 2004, it beat Chitty Chitty Bang Bang and James Bond's Aston Martin in a Post Office poll to find the UK's "all-time favourite, famous, car". The vintage Jaguar was bought by Morse producers Carlton TV in 1987 and remained in the ownership of company until the series based on Colin Dexter's novels came to an end in 2000. The car was given away in a promotional raffle the following year but was quickly sold on by its new owner for £53,200. 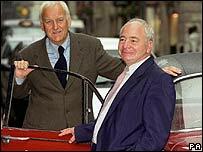 Actor John Thaw, who died of throat cancer in 2002, once said the Jaguar was a "beggar to drive". The car's most recent owner, a property management firm in north east England, found the car was reasonably presentable and driveable but was in a poor condition. It has since undergone a substantial restoration and all mechanical components have been reconditioned, replaced or repaired. The new owner said the car "deserves to be seen and appreciated by all". He said he will allow his purchase to be seen by the public at events and shows across the UK.